The women said they were treated "with respect"
A senior Italian politician says he believes a ransom of $1m or more was paid for the release of two female Italian aid workers kidnapped in Iraq. Italian Foreign Minister Franco Frattini said no money had been paid but MP Gustavo Selva described the denial as purely "official". The two Italians and four Egyptians also freed arrived home on Wednesday. British hostage Ken Bigley has made a new appeal for his own release in a video shown by an Arabic TV station. 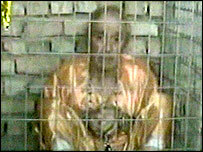 Squatting down in a cage and dressed in an orange jumpsuit, Mr Bigley said his captors did not want to kill him, and he accused UK Prime Minister Tony Blair of "lying". Tawhid and Jihad, the hardline group which seized Mr Bigley nearly two weeks ago, earlier beheaded two Americans kidnapped with him. Allegations of an Italian ransom, first made in a Kuwaiti newspaper, have been widely reported in Italy. Prime Minister Silvio Berlusconi fuelled the rumours by talking of "a difficult choice which had to be made", the BBC's Guto Harri notes from Rome. Gustavo Selva is head of the Italian parliament's foreign affairs committee and a member of the National Alliance, one of the parties in the governing coalition. "The young women's life was the most important thing," he told French radio on Wednesday. "In principle, one should not give in to blackmail, but this time I think we had to give in..."
Security experts have told the BBC that money is likely to have played some part but they also point to intensive behind-the-scenes negotiations on the part of the Italians. Mr Berlusconi has spoken of 16 separate negotiations to free the women. Before the appearance of the new video, Mr Bigley's brother Paul said he had received a written message confirming his brother would be released alive. There was also new hope on Wednesday for two French hostages, journalists Georges Malbrunot and Christian Chesnot. 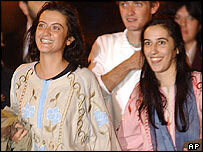 Self-appointed French mediator Philippe Brett said he had reached a deal with kidnappers to free them. He told al-Arabiya TV he had seen the two men, kidnapped on 21 August, and they would be released soon. However, the French foreign ministry said it had no knowledge of any deal and said Mr Brett was not part of any official negotiations. The two Italian women, Simona Pari and Simona Torretta, flew back to Rome on Tuesday night to a rapturous welcome, after three weeks of captivity. Ms Torretta said they had been treated by their captors "with a lot of respect". Two Iraqis seized with them on 7 September and four Egyptian telecom workers taken in a separate kidnapping last week were also freed. Sources at Cairo airport told Reuters news agency the Egyptians had said they were treated well by their captors.